VIKING MONUMENTS AND SITES / Vestfold Ship Burials and Hyllestad Quernstone Quarries is part of the Tentative list of Norway in order to qualify for inclusion in the World Heritage List. On the way from the Oslo Torp Airport to the city of Oslo I stopped at the Borre cemetery, which is part of Vestfold Ship Burials, part of Viking Monuments TWHS. There is a direct bus from the Oslo Torp Airport to Oslo, but because I stopped at the cemetery, I ended up taking 2 buses to the cemetery and 3 more buses and 2 trains from the cemetery to Oslo eventually, all in one afternoon. This was due to the fact that, because 4th public bus from Kopstadkrysset did not come (A local told me that you were supposed to call the bus company if you want to be picked up), I had to take another bus to the Holmestrand train station, and because part of the railroad between the Holmestrand station and the Oslo Central Station was under repair, I had to take two trains and yet another bus. But I would never hate Norway. It is my #1 favorite country in the world. Before visiting the cemetery I checked out the museum and a reconstructed Viking hall nearby. The museum was created over 15 years ago, but it did not seem to be in a good shape. Some of the collections did not even have tags with names or explanations, which was a surprise for such a wealthy nation. 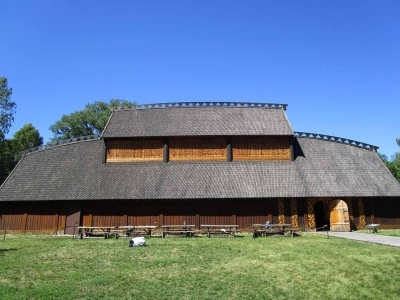 The Viking hall was similar to the reconstructed Viking building in Lofoten Islands in Norway. But this particular hall was meant as a place for feast. In other words the hall was a party venue for Vikings. Then I walked to the cemetery, or the burial mounds, which was actually nothing extraordinary. This was a day right after the Viking site in Germany was inscribed as a WHS. Norway certainly deserves a Viking-related site, but I'm not sure if this cemetery serves so well for the inscription. But there are 3 more sites included in this nomination, which I have not been to.